Sprout’s Facebook Pages Report has experienced a major redesign to include an abundance of new data. 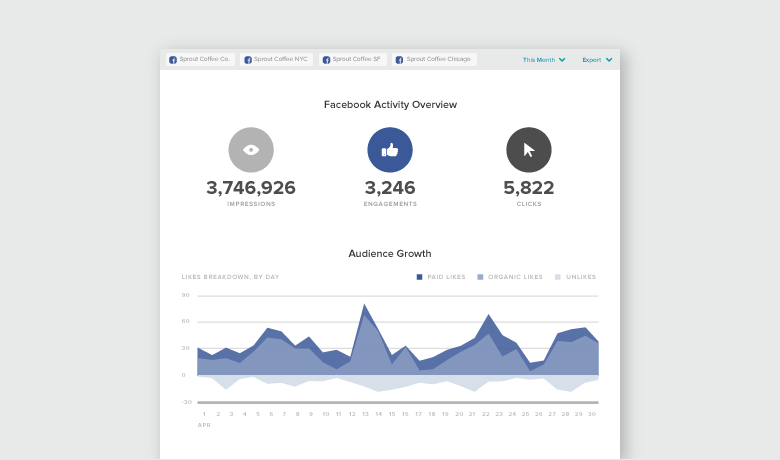 Our new report enables users to analyze message volume, engagement, paid activity and audience demographics across one or more Pages through our Facebook Analytics tools. 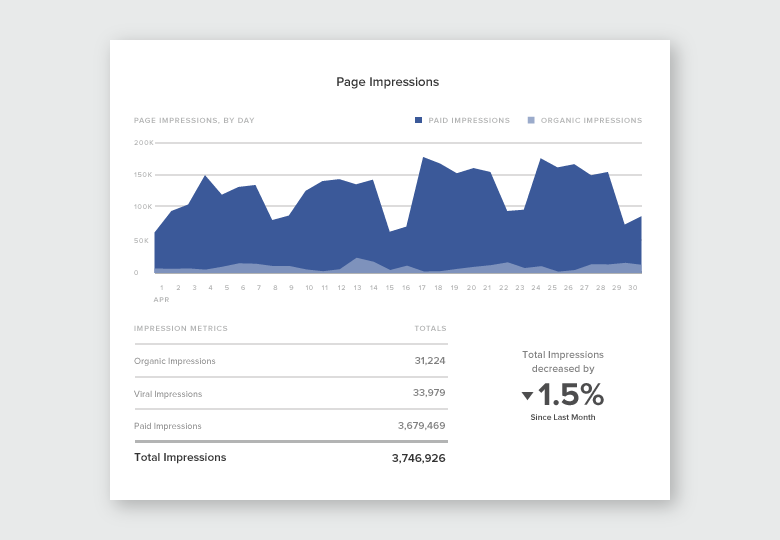 The new Facebook Pages Report includes analytics that span the social marketing spectrum and provides marketers with deeper insights into a brand’s Facebook strategy. Analyze organic likes, impressions and video views to understand the impact of your social marketing efforts. Compare paid likes, impressions and video views with organic data to determine the success of social campaigns and calculate ROI. 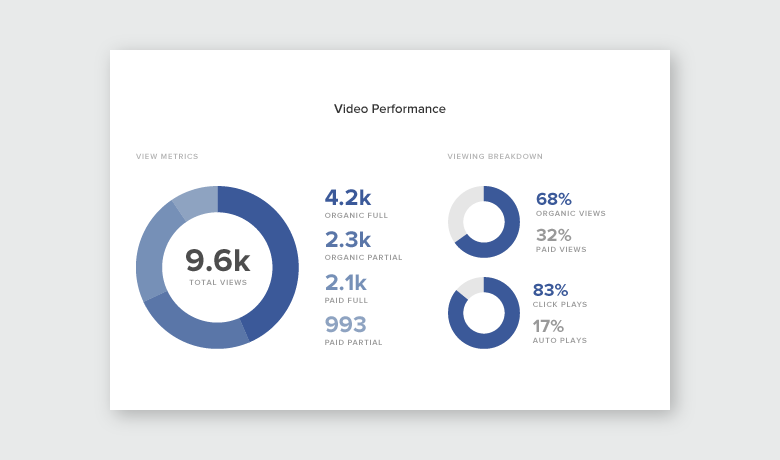 Track video viewing metrics to determine if your audience is actively watching your videos. Measure the number of clicks on links to determine if your content is driving traffic. Monitor audience engagement and action metrics to understand when and how your audience is interacting with your content. Analyze the demographics of different audience segments to inform message targeting. Overview stats across multiple Pages and breakdown this data by individual Pages for a side-by-side comparison. For deeper, post-level insights, export the Facebook Pages Report to include all sent messages. Automatically share the report in Spanish or Portuguese. In addition to new data, the Facebook Pages Report is designed to match the existing layouts of our Twitter Profiles and Instagram Profiles Reports. The design lets social media professionals digest and share learnings in a format that provides a consistent reader experience that’s easy to digest. The report has a vast array of graphs, charts and dynamic data that makes analyzing your Pages easier. The new report helps your organization quantify, visualize and pinpoint the social metrics that matter most to your business. The Sent Messages Report includes a breakdown of data across all of your sent messages so you can understand how well your published content performed. 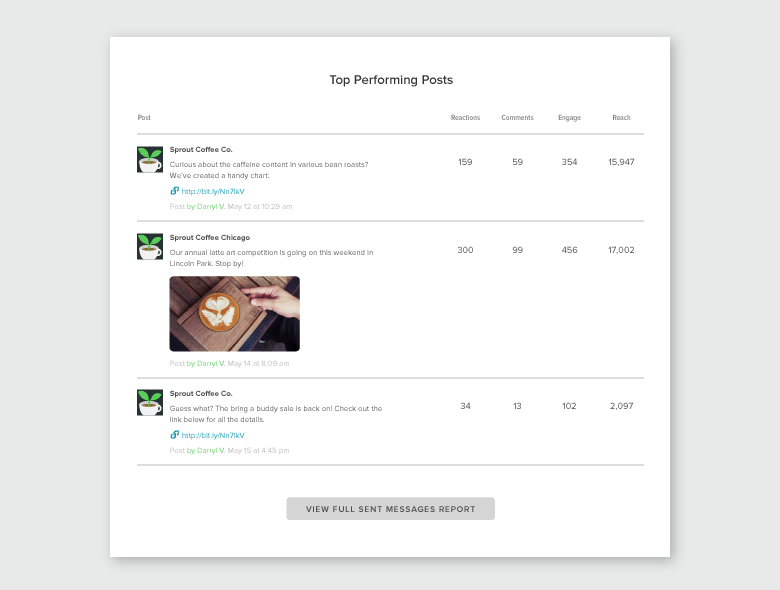 We recently added Reactions and paid reach to the Sent Messages Report to help you analyze post-level engagement. When paired with the Facebook Pages Report, you can segment a big-picture overview into content performance and audience behaviors across Pages. With a variety of organic and paid data you can pinpoint and adjust your content strategies based on what’s working and what’s not.